This is the 3rd act of a brutal repression against Belarusian anarchists in last 2,5 month. 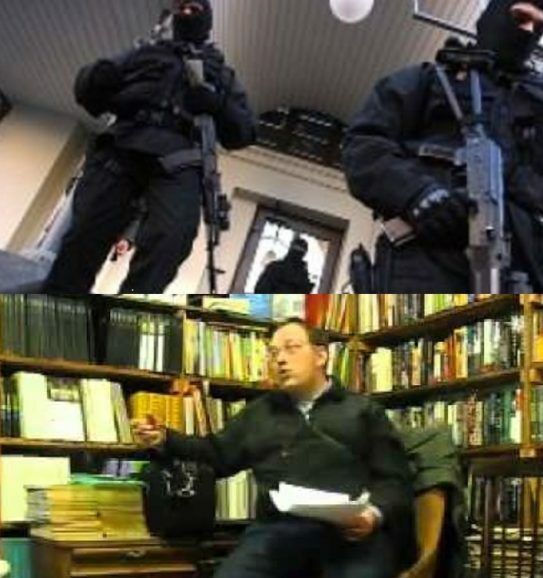 In August local police broke into the lecture of Russian anarchist and ex-political prisoner Alexey Sutuga. In September, 28th, cops searched 2 houses of Minsk anarchists and confiscated printing facilities and electronics. Pyotr Ryabov, anarchist philosopher, lecturer of department of Philosophy in Moscow State Pedagogical University was sentenced to 6 days of prison for “small hooliganism” and “distribution of extremist materials (statute 17.1 and 17.11 of codex of misdemeanors of Belarus). The Court considered Belarusian anarchist journal “Svoboda ili Smert №6”, published in 2007, as extremist material. However these were trumped up charges, real reason of the arrest was lecture on anarchist movement, for which Ryabov came to Baranovichi. Ryabov was arrested on his way back to Moscow in Baranovichi train station, he was supposed to talk in another event in Moscow. – After sentence, Pyotr Ryabov declared a hunger strike.